Classic good looks and smart design. Brooch pin has coordinating chain. Domed silver design has berry edging. Brooch about 2"; earrings about 1". Item # 573HH - original price $76. Dazzling rhinestone pin and earrings compliment many western outfits—and help Support Our Stars in the Miss Rodeo America scholarship program! Silver, copper and bronze contrast metals are combined in Renata's beautiful design. Blackened backgound highlights thie engraving. Set includes choker length chain. Pendant has a pin back to be worn as a brooch as well. Pendant about 2-1/2"; earrings about 1". 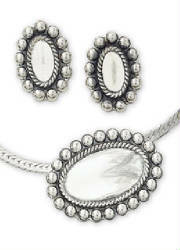 Simply elegant pendant and earring set completes your show outfit. Delicate octagonal crystal is surrounded by shimmering stones suspended on a sterling chain. Pendant (about 1") matches the pierced earrings (about 3/4"). 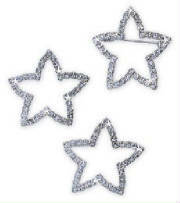 Hobby Horse Dina Rhinestone Jewelry Set ON SALE!!! Hobby Horse Dina brooch and pierced earrings set with Austrian Crystals and pearly accents. Choose Silver tone or Gold tone. 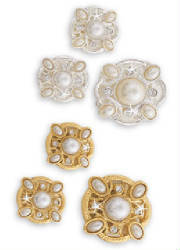 Pin 1-1/4", earrings 3/4" (approximate). 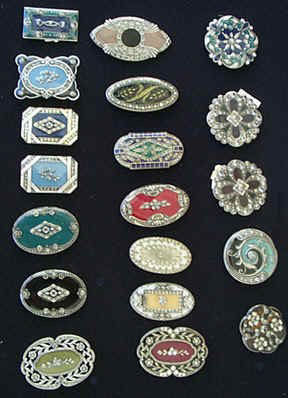 These beautiful pins come from France and are made from molds of the 1920's-1930's. 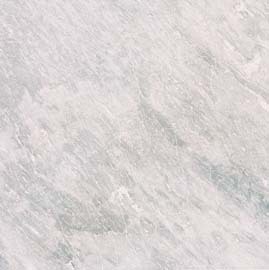 They are unique and are available in many styles and color combinations. The metal base is pewter and the enamel work has incredible depth & iridescence. Some styles have small crystals in the design. Please contact us for more information. 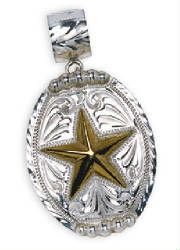 Beautiful, superior quality Sterling Silver pieces. 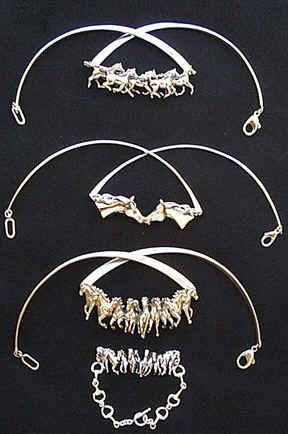 Many of these items are available in 14k Gold also, and in Sterling Silver and 14k Gold combined. This is a small sampling of the items available. Call or e-mail for additional information. Edgar Rice Burroughs, the creator of Tarzan, purchased a 550 acre ranch in the San Fernando Valley in 1919 and renamed it Tarzana. Besides being a best selling author, Burroughs became a real estate developer and in 1922, 100 acres closest to Ventura Boulevard were sold as residential lots. In 1924, 120 acres were developed as the El Caballero Country Club which still exists. In 1928, community members voted to name the town Tarzana. Over the years, more and more of the ranch was subdivided. The last remaining property (about 100 acres with the old ranch home) was operated as a nursery until 2002 when it was sub-divided into a residential development of over 50 multi-million dollar homes. (The conflicting story says the town was not named after Tarzan, but we found nothing to support this).